NEW DELHI — As India heads into an election year, the Congress Party-led government is on its last legs. After two terms in power, it is enmeshed in corruption scandals and an unshakeable perception of poor governance. Meanwhile, the Bharatiya Janata Party, India’s main opposition party, which should be taking advantage of the government’s dire condition, is faltering. Following successive election defeats, and a political environment primed for a change, the B.J.P. faces a choice: move toward the political center or cling to ideological purity and lurch rightward in an attempt at a divide and conquer strategy. All signs point to a rightward shift. The B.J.P.’s embrace of the far right is embodied by the rise of Gujarat state’s chief minister, Narendra Modi, a controversial figure who represents an uncompromising strand of his party’s Hindu-nationalist ideology. Should the B.J.P. choose Modi as its standard-bearer for the general election — a real possibility given his increasing popularity — Modi’s polarizing style would likely scare away prospective coalition partners and lead to an unstable government dominated by small, regional parties. Most troubling, Modi’s Hindu-nationalism is likely to lead to a deepening of sectarian divisions, India being home to the world’s second-largest Muslim population. His questionable conduct during the 2002 riots in Gujarat that left more than 1,000 people dead, mostly Muslims, has shadowed his ascent to the national stage. He is accused at the very least of doing nothing while Gujarat burned, and at worst of having helped to orchestrate the violence. 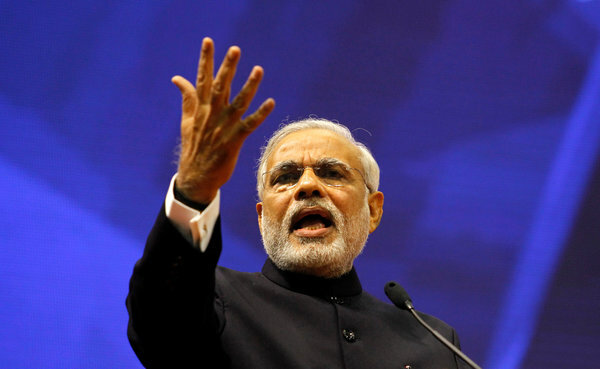 In a recent interview with Reuters, Modi did not help his cause when asked about the riots. He answered by saying his feelings of pain for the tragedy were similar to how he’d feel if a puppy had been run over by a car in which he was merely a passenger. As a consequence of the riots, Modi suffers the indignity of a U.S. visa ban, in effect since 2005, and he remains a target of human rights groups the world over. He also faces the specter of investigations into the extrajudicial killings of suspected terrorists by the police in Gujarat, which could implicate his closest aides, and perhaps even Modi himself, in the coming weeks. For all his talents he has few allies outside his party, a handicap in an era of coalition governments. The B.J.P. should now be welcoming more partners into its fold. Instead, in June it lost its largest ally, Janata Dal (United), in the large swing state of Bihar, a breakup catalyzed by Modi’s ascension. Still, most B.J.P. members — and increasing numbers of voters — seem convinced that Modi, with his larger-than-life persona and unquestioned religious pedigree, is their long awaited Hindu Hriday Samrat — the ruler of Hindu hearts. The son of a tea-stall owner, Modi, 62, has spent most of his life in politics, joining the right-wing Hindu-nationalist Sangh Parivar organization early on and rising through its ranks by displaying impressive organizing abilities. He moved to the B.J.P. in 1987 and was appointed chief minister of Gujarat as a midterm replacement in 2001 without ever having fought an election. In the decade since, Modi has won three straight state elections and engineered remarkable economic growth for his province — some even go as far as describing it as the Guangdong of India. His focus on pro-investment policies, cutting red tape, extensive infrastructure development, while using his personal charm to woo foreign and domestic investment, has been a marked contrast to most other state governments. When Tata Motors fell out with the West Bengal government in 2008 over plans to set up a production plant for its “People’s Car,” the Nano, Modi wasted no time in text messaging Ratan Tata welcoming him to Gujarat with open arms. Soon enough, the first Nano was rolled out in his state. Other corporations say they’ve found Gujarat an oasis for investment. With a national economy that has recently hit a wall, it’s no surprise that India’s business class stands united behind Modi as their preferred choice for prime minister, a trend mirrored to a lesser degree in recent national opinion polls. He describes his governing philosophy as “maximum governance, minimum government,” a creed familiar to conservatives everywhere. The lessons Modi has learned running a one-party state with a strong hand would likely not apply well to the consensual give-and-take nature of a coalition government in New Delhi. No prime minister of modern India has been able to rule by diktat. The B.J.P. would do better to look to the example of Atal Bihari Vajpayee, whose years as prime minister from 1998 to 2004 were largely characterized by a consensual approach to governing. Vajpayee was like an Indian Ronald Reagan: a true believer in the conservative cause who packaged his ideological stridency into a narrative that depicted the B.J.P. as a responsible party of governance, palatable to its core voters while allaying the fears of disparate coalition allies. But once Vajpayee left the scene, the B.J.P. steadily drifted toward the far right. The promise of a Modi victory could prove to be a mirage. Elections are still decided in rural India, where he is yet to be fully tested. Only L.K. Advani, the octogenarian co-founder of the B.J.P. and Modi’s mentor-turned-rival, stands in his path to leading the party. But Advani’s failure as prime minister candidate in the 2009 elections, and the groundswell of rank-and-file support for Modi, may undermine his quest. Yet, even if Modi is victorious, he would most likely lead an unwieldy coalition government involving decision-making by consultation and consensus, a balancing act that is not his strong suit. On key global issues like nuclear disarmament, climate change, trade and terrorism, India would find it nearly impossible to craft a coherent policy. On top of that, India relies on foreign funds to finance its alarmingly large current account deficit — currently contributing to a steep depreciation of the rupee — and if foreign investors were to lose confidence in a new and unstable government, the economy’s downward slip would accelerate. With Indians begging for good governance, the B.J.P. must decide whether to choose Modi’s ideological path or to recalibrate to Vajpayee-like inclusiveness. On that question hinges the outcome of the election — and the future of India. Krishan Partap Singh is the author of “The War Ministry,” the latest in a series of political novels set in New Delhi.